Wicked Hope is Selling Like Crazy!! I am making a double post, so I apologize for the spam, but I just checked the sales reports, and WOW WOW WOW!! I sincerely hope everyone loves the book and looks forward to reading part two of the series. 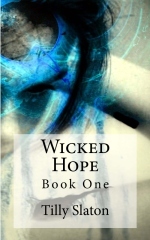 Wicked Hope is still currently FREE. You can purchase my book with a quick one click if you click this link. Anyways … I am off to finish decorating our home for the Halloween season. Pictures to come!